This is a step-by-step tutorial. 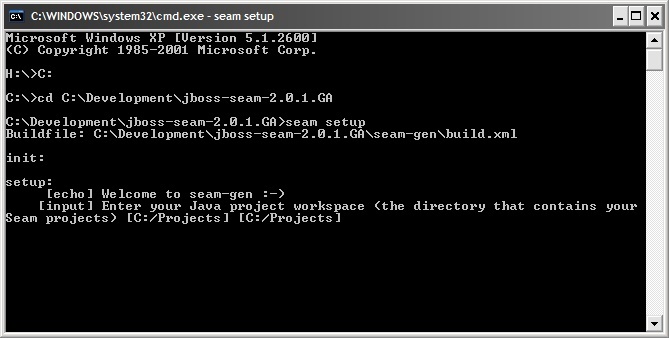 I made this Tutorial, because I was not happy with the four project folders generated by JBoss Tools 2.0.0 when I select a new Seam EAR project. The work is a bit confusing. If I create a new Seam WAR project I only get two projects (one of them is a test project). I had a lot of trouble with the WAR project. I was not able to not get the EJB3 examples work with it. Never the less the folder structure is different from the Seam-gen generated projects. This tutorial works completely without JBoss Tool. You can use JBoss Tools anyway, it has nice functions do build a RichFaces JSF page, but keep in mind that new generated projects are difficult to handle, since you have to keep an overview of all four projects and the changes you made in each of them. First of all you need to download a few things. Try to download the last GAs from the JBoss websites. Extract these files where you like but keep in mind not to use blanks ” ” or special characters “áä”. I used “C:\Development” as path. Create a new workspace folder here. Next we need to get our database up and running. Run the setup and make a “typical” installation. At the end of the setup configure the MySQL server. Choose “Standard Configuration”. Do not change anything in the next screen. Now set root password for the DB. I used “mysql” at this point (very inventive, huh?). Go to the next screen and finish the configuration. 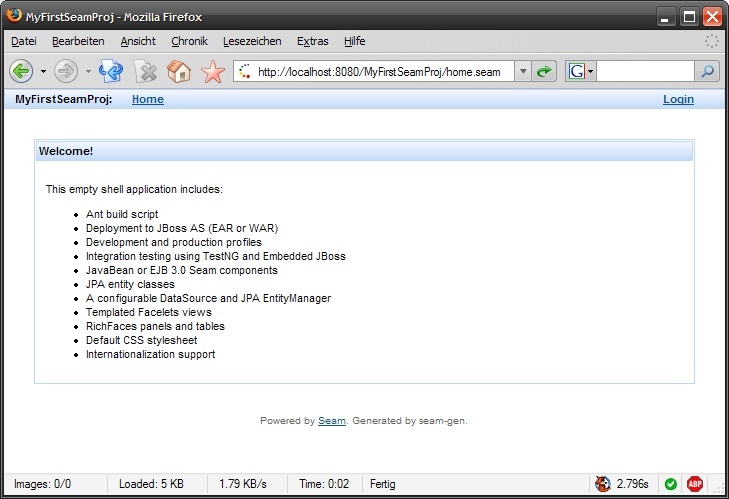 Now it is time to setup JBoss Seam. Seam welcomes us but wants to know some things about our project. Give the Seam project a name. RichFaces is fine. Hit enter. The BlueSky Theme is fine, too. Hit enter. Enter the package name of your session beans. Enter the package name of your entity beans. The package for the test cases is ok. Enter. I use MySQL, so I enter “mysql”. This is the driver class, hit enter. Now it gets a bit tricky. Enter the connection URL to your Database. I used the test database in my MySQL installation. The username was “root” and the password “mysql”. There is no DB catalog in this case. Enter. There are no tables so far. Enter. I want to keep my tables. Enter. The setup is finished. That was a lot of work, so where is my project? There is no project till now. That’s enough console hacking for now. 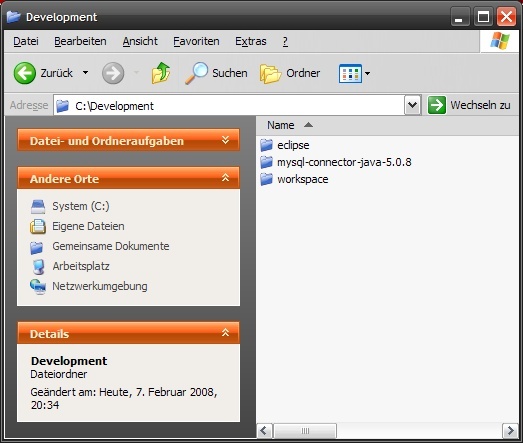 Start Eclipse and choose our workspace “C:\Development\workspace”. 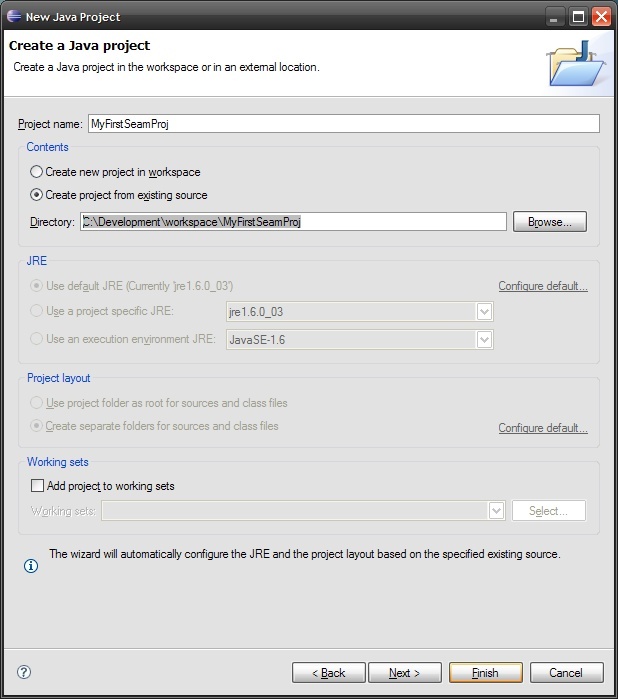 Choose “Create project from existing source” and enter the Seam project path “C:\Development\workspace\MyFirstSeamProj”. Enter Project Name “MyFirstSeamProj” and click “Finish”. Click on the “Servers” tab. Right click and create a new one. Choose JBoss v4.2, than next. Enter Application Server directory “C:\Development\jboss-4.2.2.GA”, than click “Finish”. Start the Server by right click, “Start”. Open the project, right click the ant file “build.xml” and click “Run as” => “Ant Build”. An error appears! Why? The Windows file system does not like a file and a directory with the same name. Open the Explorer and go to “C:\Development\jboss-4.2.2.GA\server\default\deploy” and delete the MyFirstSeamProj.ear folder. Let’s try again. Start the server. That’s a bit better. Now it is time to open the page of our new Seam project. There it is, your first Seam project! Now it is time to test a Seam example. I used the simple “Registration” example. Copy Register.java, RegisterAction.java and insert it in your Eclipse project at src/action in the package “com.mydomain.MyFirstSeamProj.session”. It is the Windows file system again. Go to “C:\Development\jboss-4.2.2.GA\server\default\deploy” again and delete the “MyFirstSeamProj.ear” FILE this time. The error should now be solved. Go back to the Eclipse project and make a new package in “src/model” and name it “com.mydomain.MyFirstSeamProj.entity”. Copy “User.java” from the example in this package. Now you must correct the package entry in the source files in your eclipse project to “com.mydomain.My…”. In “RegisterAction.java” you have to import User from “com.mydomain.MyFirstSeamProj.entity.User”. Save all files. Go to the root directory of the Registration example and copy all files from the view folder into the view folder of your eclipse project and override the existing. The deploy method is explode, what does this mean? Open your browser and to http://localhost:8080/MyFirstSeamProj/ again. The Seam Registration example is already running. 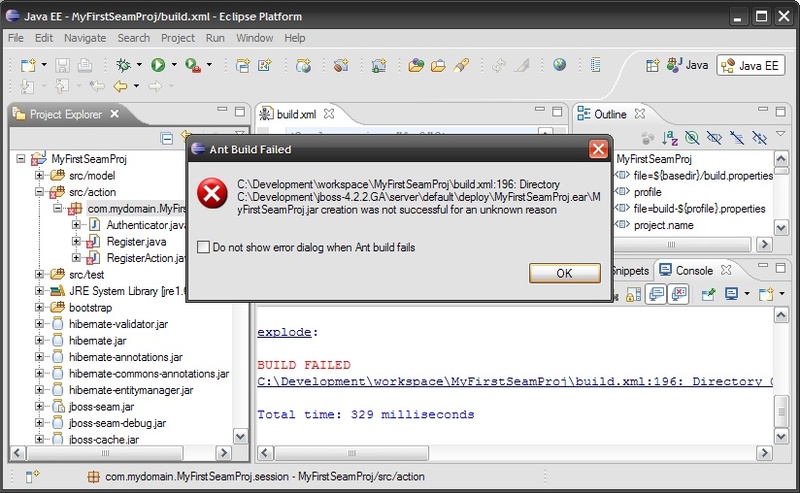 But to be sure that nothing went wrong, stop and start the server in Eclipse again. 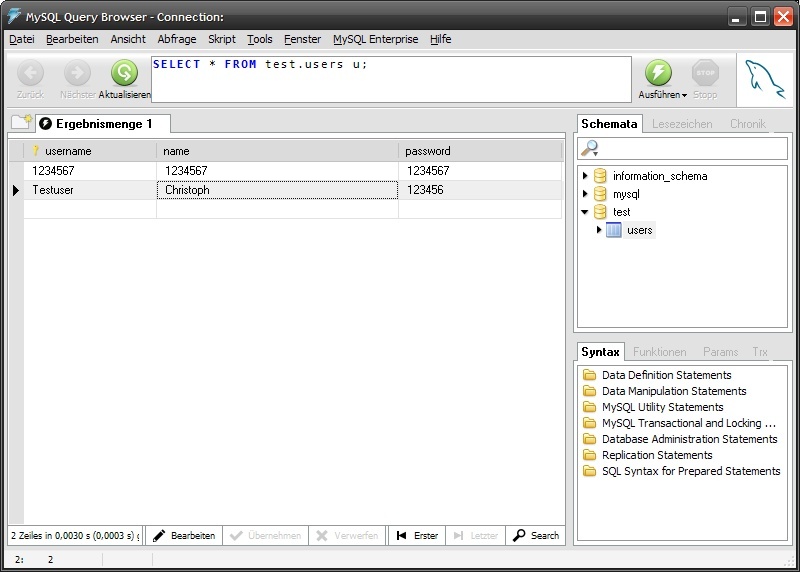 Now you can register a new user in the browser and look into your database with the query browser.